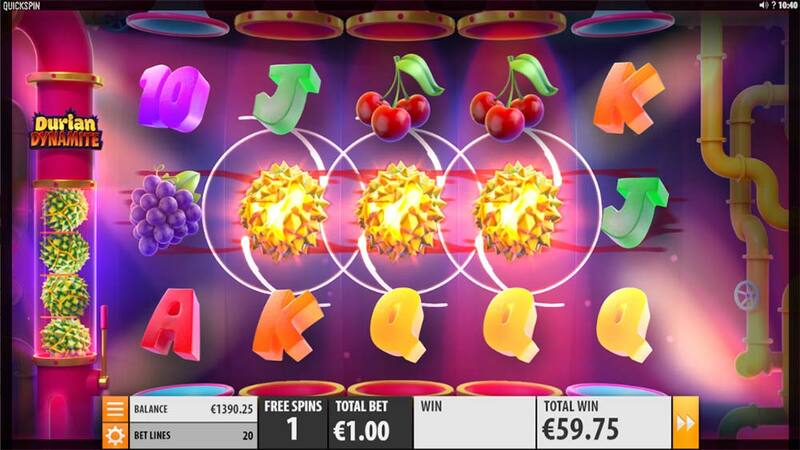 We Check Out the Durian Dynamite Slot From Quickspin, Hailed as a Classic Fruit Machine With a Modern Twist! Quickspin is all set to release their latest slot Durian Dynamite on the 9th April 2019 and Unibet Casino looks to be a great casino to check it out in with an already vast choice of Quickspin slots already playable at their casino. 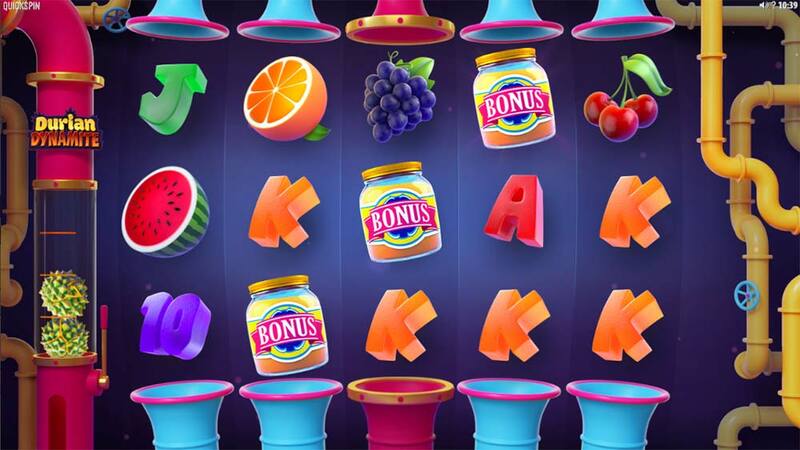 Durian Dynamite is designed with a classic fruit machine style (classic fruit symbols) but comes with a few modern twists that include 3D like graphics and special Durian Exploding Wilds that can spread and explode on the reels in a chain reaction style. Quickspin is pitching this as a highly volatile machine, and normally we would take this with a pinch of salt as their slots tend to focus on the more lower variance, but with the addition of a bonus picker feature that grants extra spins, extra ammo, and extra reels for Durian explosives the bonus rounds can vary substantially. Add to this an Extra Pick feature and the combinations you can get in the bonus rounds really do vary along with the bonus end results which in our thorough playtests ranged from 0 up to 700x stake! The main bonus round is triggered by the regular 3 scatters and from here you get a few extra picks from the clickable jar which can grant 3-6 random upgrades for the free spins round, along with sometimes a few extra picks awarded at the end of this to add even more! You can check out all of the base game and bonus round features in the gameplay video below. When a Dynamite Wild lands on the reels if another Dynamite Wild hits it they will explode and split into two Wilds, if these then land on other Dynamite WIlds they explodes creating a chain reaction type effect with wilds spreading across the reels. 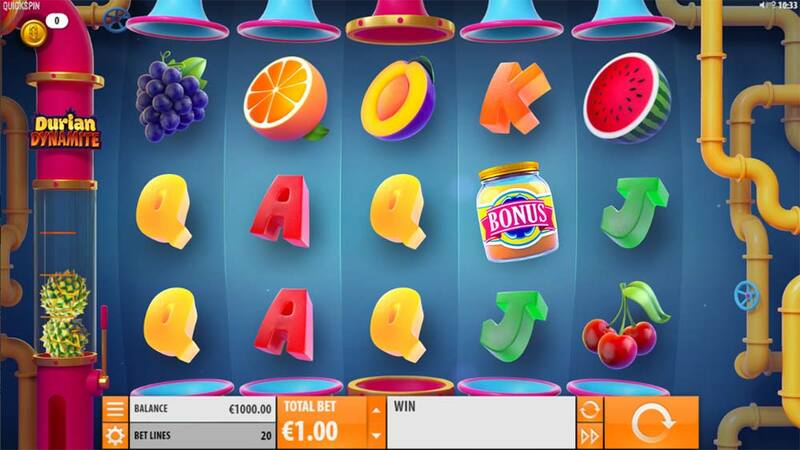 Triggered by 3 Bonus Scatter symbols, first, you play out the Bonus Picker round where you can earn more free spins. extra Dynamite reels, and extra ammunition to launch at the Dynamite wilds. 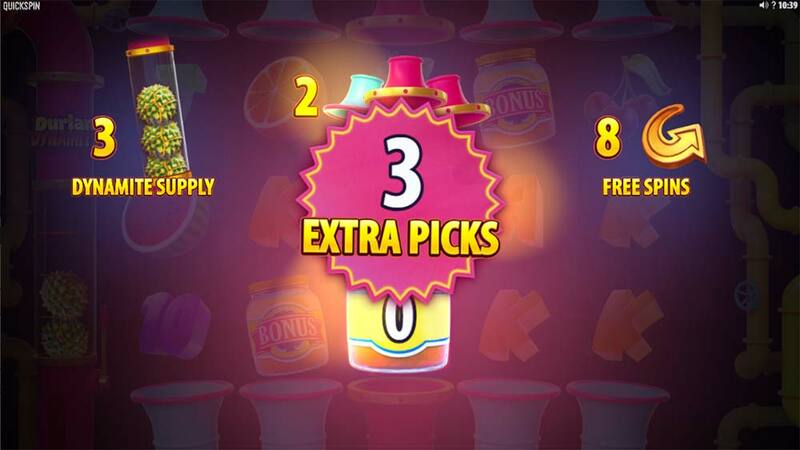 If you are lucky you can also get extra picks from the jar giving you further modifiers to the bonus round. During the bonus round the Dynamite Wilds are much more frequent than in the regular base game. 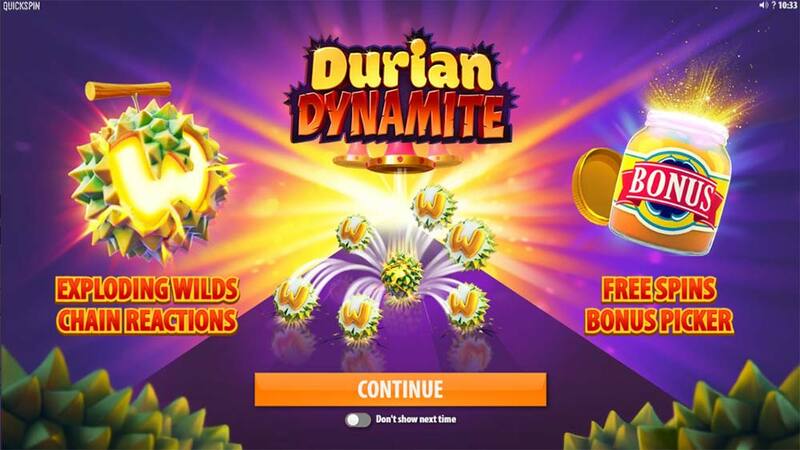 Durian Dynamite is a quirky little slot release from Quickspin, certainly, the design and the exploding wilds are a little different from many of the current slots and quite enjoyable when lots explode! The base game did feel a bit lacking at times as there is only really the wilds feature to help score any wins, so you really are just hoping for a regular bonus round trigger where the potential wins really ramp up. 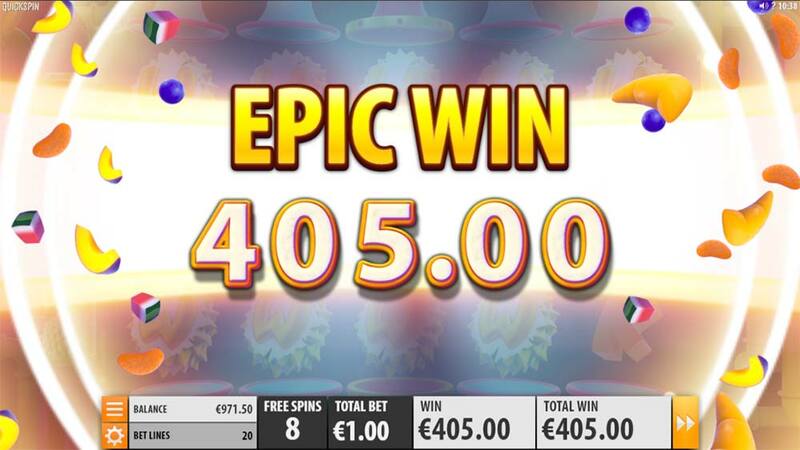 The variance is definitely there as we had bonus end results in the range of literally 0 right up to 700x stake with many bonuses in the 50x- 100x range too, but the key factor really is how lucky you get on the picking round before the bonus begins, and if you are lucky enough to be awarded a few “extra picks” too. 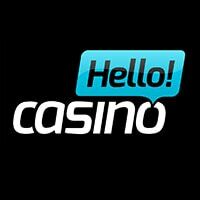 It’s certainly worth a look with real money but just be aware it may be a little higher variance han some of the other Quickspin slots and the biggest wins are very dependant on the bonus features.